We've recently been seeing more and more examples of animation being used as a tool for education. The latest to catch our eye is Kurzgesagt's admirable effort to explain how the universe came about in a six-minute short film. From gluons to quarks, hadrons, atoms, stars, galaxies, plasma and finally light, the incredibly scientific story of the Big Bang is made that little bit easier to digest. As the name might suggest, ('Kurz gesagt' is German for 'making a long story short'), the team is known for using Adobe Illustrator & After Effects to design simple animations that present complex topics. Previous shorts have included Three Ways to Destroy the Universe, How the Stock Exchange Works and How Evolution Works. Unfortunately however, not even Kurzgesagt has managed to unify Einstein's relativity and quantum mechanics theorems to explain just what happened to cause the Big Bang in the first place. Anyone who can come up with an answer to that conundrum has a Nobel Prize with their name on it! Animatron is a small start-up with big ideas. The Boston-based company is hoping that the free tool it has developed for amateur animators will challenge Flash and give would-be Walt Disneys everything they need to create web-based masterpieces. Animatron, which began development in 2011, provides artists with the option of starting an animation from scratch or uploading assets that have already been created, such as backgrounds and characters. The creators have also made it possible to import another person’s project to play around with. The big "selling point" for Animatron however is that it is free, unlike Flash. 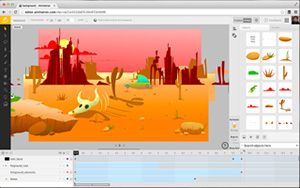 Company CEO, Dmitry Skavish, is quoted on BetaBoston saying: "The initial idea was to create an animation tool to kill Flash, and we are trying to create something that is easy to use, something for designers who aren't developers - even for kids." Animatron also negates the need for people to share large files, as collaborators can access projects via a link and work within the browser. Because there is already a stack of characters and props available, it's possible to start creating straight away without the need for any complicated design work. Animatron is ideal for animators who want to get stuck in without putting out the bank manager. Props to the creators! A fantastically fun bunch of 15-second animations starring 'Action Movie Kid' are causing an internet sensation. Through clever editing, dedicated dad Daniel Hashimoto has given his young son, James, superhero capabilities including his own Lightsaber, Lego Blaster, grappling gun and even the ability to disappear through a puddle and shoot off into space. The crafty animation employed by Hashimoto means James no longer has to simply imagine crossing his lava-pit living room floor or destroying a toy store with a bazooka, because the films bring his ingenuity into existence. The proud father says on his YouTube page: "My three-year-old kid is awesome. He gets into some epic situations which remind me that life is an adventure." Each animation took between three hours and three days to edit, with Hashimoto, an animator for DreamWorks, employing the CGI skills he has used on films including Kung Fu Panda 2 and How to Train Your Dragon to create these convincing shorts. London's Saatchi Art Gallery has come up with a way to celebrate one of the oldest web-used file formats, the art form known as the animated GIF. The humble GIF (Graphics Interchange Format - now you know) was first created by CompuServe back in the early days of the internet, and although limited by eight bits per pixel and 256 colours, became a popular tool for creating simple animations and low-res film clips. Because a GIF file is so small, they can also be easily embedded into websites and shared on social media pages. This, combined with the ubiquity of the smartphone, means anyone can create GIF motion photography videos. Lately there has been a resurgence in 'GIF art' via short animated clips or 'cinemagraphs'. The Saatchi Art Gallery has teamed up with Google+ to create the first ever Motion Photography Prize, challenging entrants to use this simple format to create something special. The six categories - which include Action, Lifestyle, Landscape and Night - will be judged by luminaries of the art and film world, such as Tracy Emin, Cindy Sherman and Baz Luhrmann. An Irish animation has scooped the prestigious Best Animated Short Film at the South By Southwest (SXSW) Film Festival in the US. 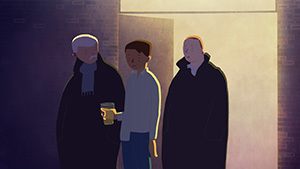 CODA, a nine-minute hand-drawn piece written, directed and edited by Alan Holly, tells the compelling story of a meeting between Death and "a lost soul who stumbles drunkenly through the city". A small team of animators spent two years painstakingly bringing the story to life, generating extra respect for each immaculately created frame in a world dominated by CGI. The film beat more than 4,000 entries to claim the top prize. Who said the pencil is dead? Monsieur COK, a disturbing animation written, designed and directed by Franck Dion, has already swept awards festivals around the globe and is now available for all to see on the net. The story follows the eponymous bomb factory owner, uncannily reminiscent of Terry Gilliam's vision of Humpty Dumpty, as he strives for more efficiency and greater profit by replacing his workers with robots. However, one employee refuses to take his redundancy lying down. The making of the industrial gothic masterpiece took a year, with the drawings, sculptures and sets all the handiwork of Dion. The characters were created with a melancholy palette of muted colours, conventional paper cut outs and photographs of puppets. Miniatures were used to build the sets, and the snappy paced editing, additional animations and compositing took place in Paris. The film is grotesque and haunting, yet strangely beautiful, and although the hammer and sickle wielding employee makes the politics of the piece a little too obvious, there is dark humour in this nightmarish nine-minute short that demands several viewings. We’ve just heard about Cuerdas (Strings), an award winning animated film bringing the issue of cerebral palsy to the mainstream. Spanish writer and director Pedro Solis depicts the friendship between a young enthusiastic orphan named Maria and her new classmate Nicolas, a character who suffers from cerebral palsy and is based on Solis' own son. While on stage accepting his Goya this year, Solis told the audience: "The child is my son, the chair is my son's. They are his small hands and his teeth that have been decayed by drugs". The orphan Maria is based on Solis' daughter, who, he explained, like the ever-inventive animated character, has never stopped looking for different ways of playing with her brother. Although we have only seen it in Spanish, Cuerdas is a fine example of why the best animation tends to transcend language. The story tells itself effectively even without subtitles, and as well as garnering awards, ithas been attracting the adoration of families around the globe who know what it's like to have children with cerebral palsy. Solis says: "The film is just where I wanted it to be: It's reaching the children, schools, and is educating them".